It was a cold and miserable night and C.W. had just called up and asked me if I wanted to go for a walk. I tried begging off but he said this was important and that I should bundle up and come downstairs. When I still hesitated, he reminded me of my obligation as his North American host. What could I say? I exited the back door and immediately wished I hadn’t. It was frigid, and there stood the perfect imitation of a 1930s college student complete with raccoon coat, a hat with the front pinned up, and the type shoes that we used to call “saddle oxfords.” He was holding a pennant that simply read “State U” and was obviously excited. 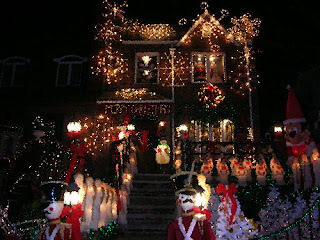 He was referring to the Christmas decorations adorning the homes and yards along the street. “Come on,” he said. “Let’s walk. “I can’t go walking with you looking like that,” I said. “C.W.” I said. “They are just Christmas lights. People put them up every year.” He had grabbed me by the hand and was pulling me along the sidewalk. We stopped in front of an old, old house of the type so prevalent in this part of town. The structure itself was decorated with all the architectural features that the Victorians could imagine. In addition to that, the owners had attached lights outlining each of the features and had included lawn ornaments lighted with flashing illumination. “Is that not something?” he said. “It’s something all right,” I said. “It’s a big waste of money and time.” I don’t know what made me say it. Maybe it was the cold. Maybe it was the getup he was wearing, or maybe it was that stupid smile he had on his face. Did I mention that it was freezing? Well, as if to emphasis it, snow began to fall, drifting through the bare limbs of the massive oak trees that adorned downtown Little Rock. “Oh my goodness,” C.W. said. He stood motionless as he watched the flakes fall between us and the lights. “Shush,” he said. “Be quiet,” He was enthralled at the quiet beauty of the scene. I stomped my feet with impatience. Best Holiday wishes to all. - C.W. “And just what is that?” I said. He reached into the pocket of his massive coat and retrieved a scrap of paper. “This man named Ron Wild put it best,” he said. He moved toward me to use the light of a street lamp and read. “Couldn’t you just try? Just once, at this time of the year?” he said.